How could you not feed this adorable face? A Monkey Mountain in Germany? Yes, or Affenberg in German. 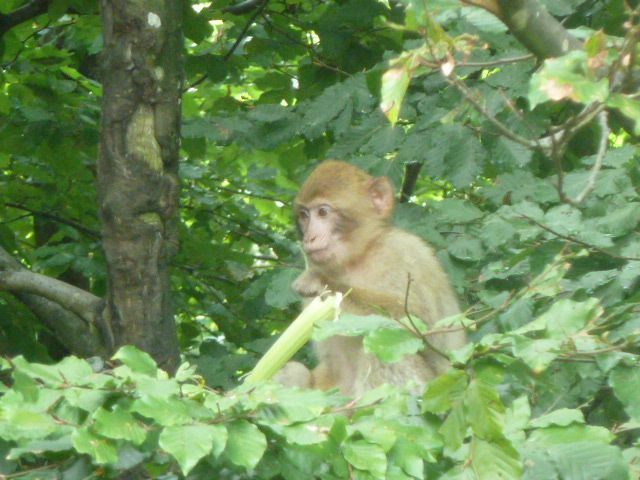 Located near Lake Constance (Bodensee) in southwest Germany lies 20 hectares of forest with Germany’s largest open-air monkey enclosure home to 200+ Barbary macaques. Surprisingly, Barbary macaques feel right at home in Germany, since their native origins are in the high mountains of up to 2000m in Morocco and Algeria. Monkey Mountain is not really a mountain but more of a small hill covered in forest, but I was especially interested in it since I have a Bachelor of Science degree in Primatology (study of primates) and any chance I have to observe primates, I am there! I must admit though I was a bit apprehensive as I want to ensure that I am supporting a place where the animals are well cared for. Fortunately, I had a friend who had been there and has worked in animal welfare and she had a good impression of it, so off we went. 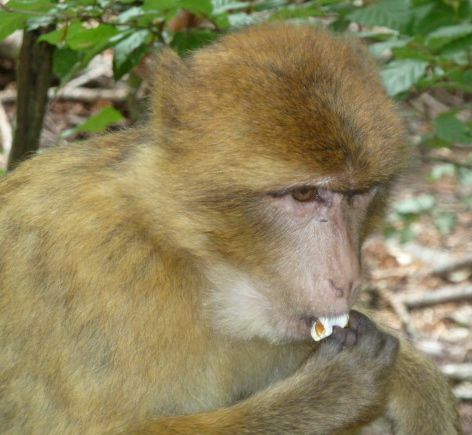 Those macaques like their popcorn. Upon entrance and a €8 admission fee (children under 6 are free), visitors are instructed to stay on the path and not pet the macaques or harass them in anyway. 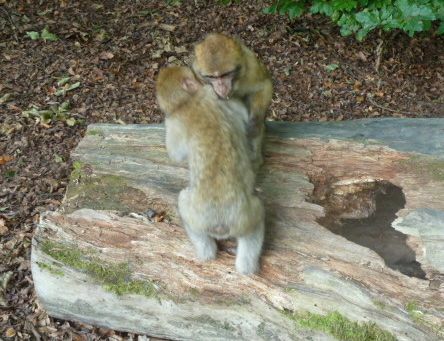 Rules given, visitors make their over to the next staff member who carefully watches as visitors can take a handful of popcorn to feed the Barbary macaques. You are only allowed to feed the macaques that are sitting on the wooden fence, wanting to be fed. As I tried to lure a baby macaque sitting just inside the fence with a piece of popcorn I was promptly (but fairly) reprimanded by one of the staff members. I was impressed by the number of staff members around who would seemingly appear out of nowhere if someone tried to break one of the rules. If a Barbary macaque wants to eat popcorn, they know where to get it – which was clear by the rather ample size of some of the macaques. It’s not easy to lose that baby weight when you eat popcorn all day long! Barbary macaques can only be fed when sitting on the wooden fence. 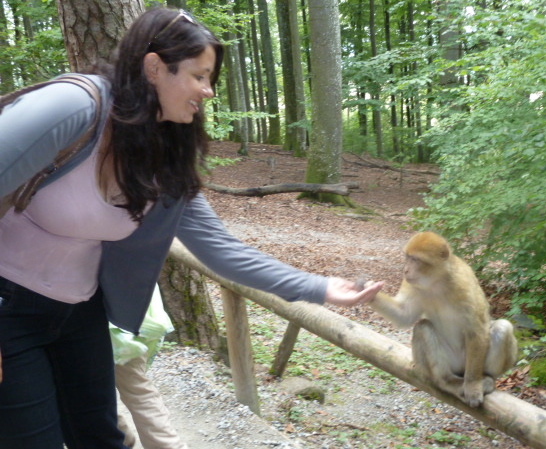 Me feeding a Barbary macaque, this time when he was sitting in the right place. I was also surprised, but pleased to learn that popcorn makes up less than 15% of the Barbary macaques diet at Monkey Mountain. In addition to popcorn they’re fed fruits, vegetables and seeds. Celery seemed to be the most in demand vegetable that we saw when we were there. Celery was a popular treat for the macaques on the day of our visit. The Barbary macaques also have plenty of ample room to get away from the visitors, including a forest on both sides of the visitor pathway and if you looked carefully you could see the odd Barbary macaque sleeping peacefully in a tree, or all of a sudden from the quiet forest leaves would come crashing down beside you as a Barbary macaque made his grand entrance – subtlety does not appear to be a behavioral trait in Barbary macaques. This little guy took a short snack break from playing chase, before he was swing from the trees again. Nice to see that he chose a healthy snack. In addition to feeding popcorn to the Barbary macaques, we also observed other behaviors, including playing which was hilarious watching the young macaques using tree branches in their quick paced games of chase. A highlight of Monkey Mountain for me was watching the adorable young ones play. Grooming was another popular behavior. Typically, lower ranking individuals will groom higher ranking individuals in the hopes of getting into their good graces and having them protect them should they ever get into a fight with another member of the group. For the high ranking individuals it’s like the equivalent of getting an hours long massage everyday -ahhh the good life. Perhaps the onlooker is jealous that she doesn’t have a groomer? Conservation also plays a role at Monkey Mountain. Unfortunately Barbary macaques are an endangered species and the population of macaques at Monkey Mountain contributes to the safety stock of the species. I also believe behavioral research has been done in the past at Monkey Mountain, but I couldn’t find anything confirming that behavioral research is currently being conducted. Monkey Mountain was my last day trip from Stuttgart with the Stuttgart girls, who thoughtfully planned such a fun excursion (thanks so much Ashley) and I thoroughly enjoyed it. Not surprisingly it is also a popular attraction for families. I plan to go again, but this time in May when all the babies are born! For more information on Monkey Mountain see Affenberg. You really find the coolest places! :) It's nice to read that they give them lots of space and "protect" them from visitors. I love zoos and aquariums, but when you can tell that the animals aren't kept well, it can be such a depressing experience. So cute! In Ecuador I visited a rescue centre for monkeys and it was a lot of fun but also so sad when the workers told us the stories of where and how they rescued the animals. Who would have thought? 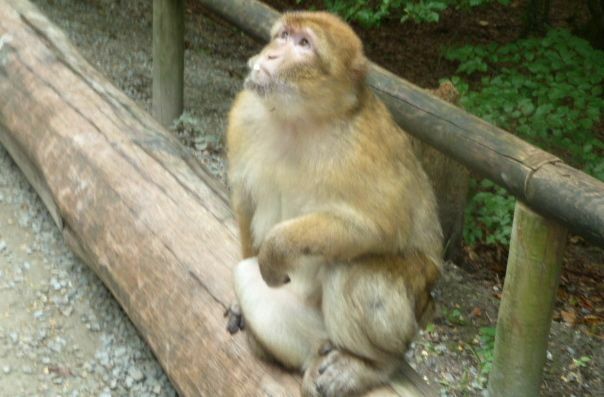 Monkey in Germany. Obvioulsy a nature reserve which gives them space and protection. And your pictures are so cute. These guys are so cute! Great photos. Cute! funny that these monkeys seem so laid back and tame. the monkeys at some of the temples in Japan are CRAZY. As in, "I'm running for my life from these creatures." type of insane. A primatology degree sounds impressive! You'd love the Singapore Zoo, but perhaps not many other zoos in Asia. Monkey Mountain in Germany looks like fun, though. I love monkeys, especially the babies! Monkeys are funny little creatures. Tricky ones too, they love to steal food! I've seen a lot in Thailand and in Central America and sometimes it's better not to get to close. I guess it's different in an enclosure. My kids would absolutely love this place! what fun photos!! i am always laughing at the grooming photos. sometimes we pose like that, for laughs! This is a perfect activity for families in Germany - I love it. With your permission I'm going to link to your post on my blog tomorrow. Thanks so much for your comments everyone. Thanks Sonja, yes please go ahead. The families we saw were really enjoying it and the kids loved feeding the monkeys. This is looks like a great adventure for kids! About a 4 hour road trip for us, so I need to research other activities in the area or along the way and make it a weekend trip. Thank you for sharing!! We made our first trip to Germany this summer after hosting our exchange student in the USA. His family took us to Monkey Mountain and a fun time was had by all. I would recommend Monkey Mountain to anyone, near or far. Don't forget your camera. It's a great place with many photo opportunities! Hi Ann, Glad to hear that you also enjoyed Monkey Mountain, great tip about the camera. I took over a 100 photos. Hope you'll come back to Germany sometime soon.